No units between the Oceanfront unit and the beach. The distance to the water may vary, but there are no units between you and the ocean. With very few exceptions, most Oceanfront units have a good view of the Ocean with an easy walk to the water. View our Outer Banks Vacation Rentals Oceanfront. Units are located between the Ocean and Beach Road. While a few of these have an unobstructed ocean access, all are near and easily accessible to the ocean without crossing any major streets. Most of these have some ocean view. Most houses on the Oceanside have a very short walk to the beach. View our oceanside rentals. Units are located on the west and front sides of Beach Road, NC 12 in Duck, Southern Shores, Kitty Hawk, Kill Devil Hills and Nags Head and NC 1243 in South Nags Head. There may be one or more properties located between the subject property and the Ocean and a two-lane road must be crossed to get to the Beach. Most homes in this category offer Ocean Views and a short walk to the Beach. Please refer to individual property descriptions. View our Beach Road rentals. Located between the Beach Road and U.S. 158 By-Pass or N.C. 1243 in South Nags Head, which do not front the Beach Road. Access to the beach is via public or development access points usually located a short distance from the vacation home. View our between the highways rentals. Located in Sea Scape Golf Course at the 2 Milepost in Kitty Hawk or on the Nags Head Golf Links at the 15 Milepost in Nags Head. Great vacation homes for those who love to play or watch golf. View our golf course rentals. Houses are located closer to the sound than to ocean. Sound view probable, but not guaranteed. View our soundside rentals. No units between the sound unit and the sound. Most have private docks or steps to the water and sound view, but they are not guaranteed. View our soundfront rentals. Homes are located on navigation canals that are specific to neighborhoods/subdivisions on the Outer Banks. We have homes that are considered canal front in Colington Harbour in Kill Devil Hills and Old Nags Head Cove in Nags Head. View our canal front rentals. 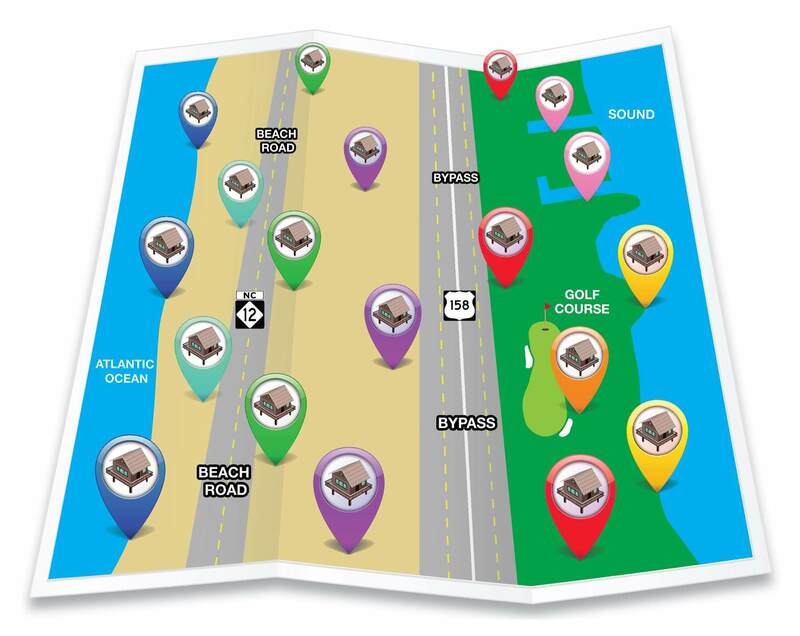 Located in Southern Shores and Duck, these homes are situated west of NC 12 (Ocean Blvd.) and are closer to the beach than the sound. These homes do not front the Beach Road and have varying views, access, and distance to the beach. View our dunes rentals.